The Basil Wanderlust Double Bag is an ideal choice for those after extra storage on the go, with eye-catching style accents and user-friendly features. 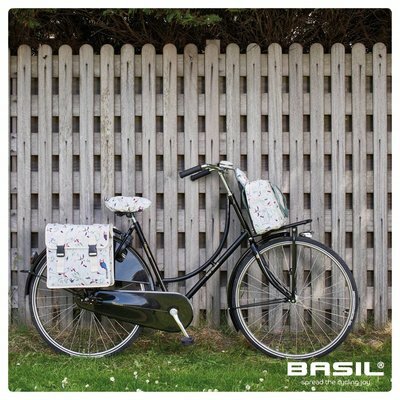 The Basil Wanderlust Double Bag comes in timless white, with an impressive bird print that’s bound to raise a smile. Ideal for injecting some character into your bicycle, this bag is also loaded with storage space with two separate compartments to house even larger items. There’s 35 litres of internal capacity in all, meaning you’ll never have to compromise on what you take with you on your cycling adventures. This bag is lockable thanks to secure snap-fasten closure, with easy attachment to a whole host of luggage carriers, including e-bikes. Reflective details are also on hand to ensure you maintain high levels of visibility in the dark, a great perk for safety conscious cyclists. Part of the Basil Wanderlust collection, you’ll find an impressive selection of coordinating products available right here online. Browse the range today for more colour options, single sized variants and more exciting essentials. Reflective details provide enhanced visibility in the dark. This bike bag can withstand moderate downpours thanks to water-resistant fabrics. Each hemisphere of this bag are tethered together, while the design allows you to attach further items like child seats to your carrier if necessary. Suitable for various luggage carriers, including e-bike types.